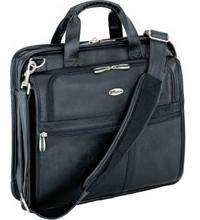 The Ultra Lite Corporate Traveler is designed specifically for Ultra-lite portable computers. Constructed in rugged ballistic nylon, the Ultra Lite has a notebook compartment that protects standard 14 inch notebooks with our patented SafePort Air Protection System. The top-loading design conveniently makes it easy to get in and out of the notebook section- a must-have for airport checkpoints. Other features include a hidden side mobile phone pocket, a shock-absorbing shoulder strap, and workstation with pockets for PDA, media, business cards, pens, pencils and more! Fits 14" size notebooks up to 12.125" x 2.0" x 10.125"